To the airport in just 43 minutes. December. 30, 2010 11:40. sannae@donga.com. 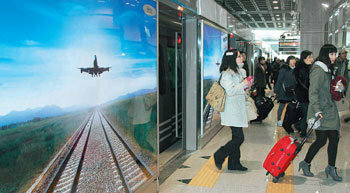 Passengers get off an AREX train at Incheon International Airport Wednesday, the first day that the airport direct rail ran its entire route. Going from Seoul Station to the airport takes 43 minutes. Regular trains run at six to 12-minite intervals, while the express operates every 30 minutes.